It’s really easy to ripen tomatoes at the end of the season – no wrapping required. Use these tips for what to look for and 3 easy steps to make sure your tomatoes don’t go to waste. I’ve mentioned occasionally (usually writing about things like what to do with pounds of tomatoes) that I ripen tomatoes at the end of the season by harvesting and bringing them indoors, but I haven’t ever written what I do, how to do it, and what to look for. I finally took some pictures for you as I went through this fall ritual a couple weekends ago because it’s super easy and I reliably get tomatoes to ripen with these lazy simple steps. You’ll usually find me grabbing any tomatoes with ripening potential (more on that later) in October – hopefully late October or early November if it’s been a mild fall – but some years I may have to harvest the green-ish tomatoes at the end of September. Here in the Willamette Valley of Oregon (zone 8) if we get rain off and on for a week or more at the end of the season, the tomatoes start to split and mold. Any time this happens or a heavy, cold rain was predicted, I fill baskets with any tomatoes I can salvage. What about wrapping each tomato to ripen with newspaper? As you may have figured out from reading AOC, I like to do things the easy way (freezing vegetables without blanching, designing a garden for easy maintenance, and super easy crafts to name a few). So in in the fall when I have tomatoes, peppers, zucchini, and corn coming out of my ears I would never have time to individually wrap each tomato like I read about here. For example, I had more than a 5-gallon bucket full of green tomatoes this year and didn’t have an hour or more to spend wrapping each of them. But that’s only half of it – then you have to check them by unwrapping each tomato and then re-wrapping the ones that aren’t ripe yet. Over and over again. Now, all you wrappers out there – I love you. One day I may be you. But my simpler method works for me now – it ripens tomatoes that may go to waste on my vines but are perfect for fresh eating or making into Roasted Tomato Sauce to freeze (I don’t can with late season tomatoes since they are typically from late-blighted vines in my garden). And since I’m sure there are a few more out there like me (right?…right? ), I’m sharing my fairly quick and definitely easy method. 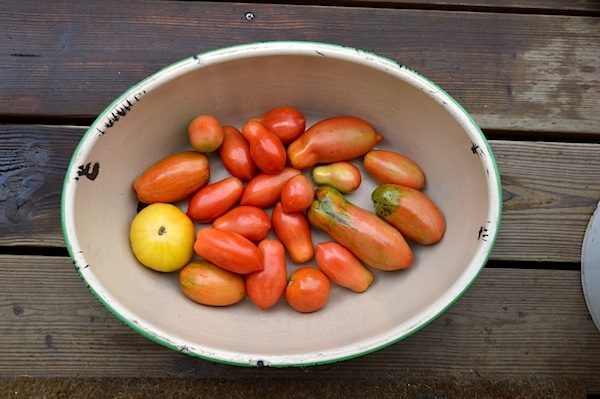 Below you’ll find the tips I use to FIND the tomatoes that will ripen (and those that won’t – yes there are some) and then the other two steps I take to ripen tomatoes. A hint of yellow on the side – this tomato pictured happens to be a Pineapple heirloom which is yellow, but if any green tomato is slightly yellow, there’s a good chance that it will ripen if brought inside. 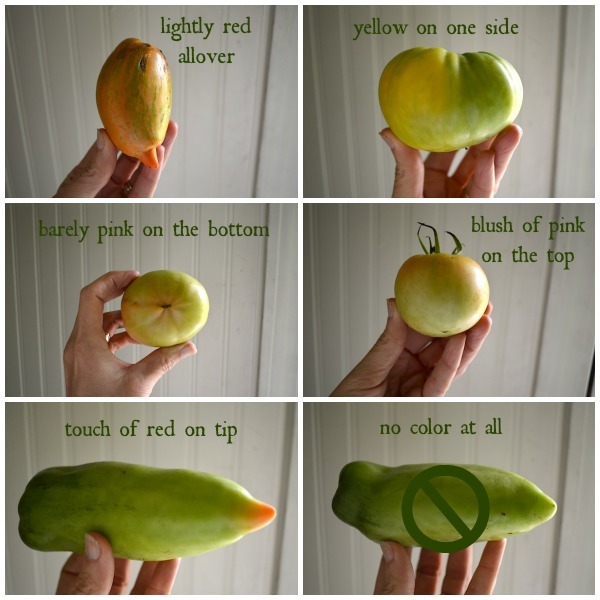 Starting to turn pink on the bottom – inspect all sides of the tomatoes and if you see any color, harvest. Any blush of pink on the top – again, harvest with a touch of any color. A red tip – this Amish Paste tomato always starts to ripen at the tips, so I harvest even though the rest is solidly green. Step 2: Separate. 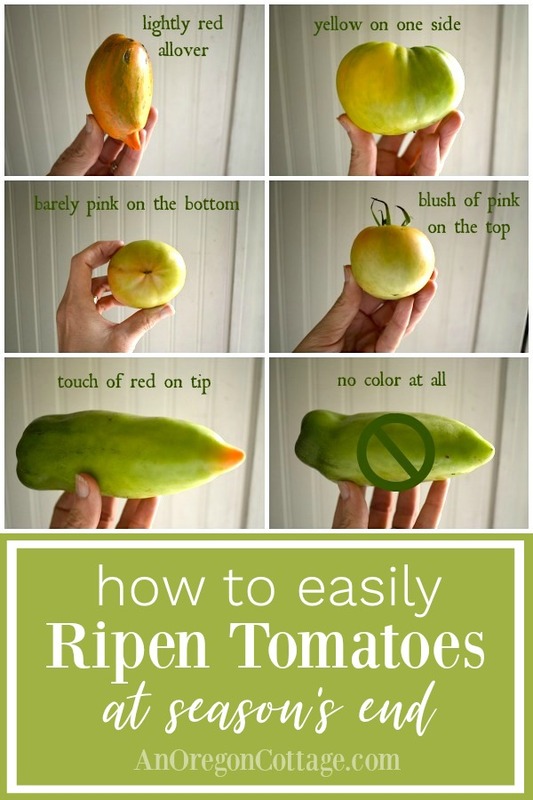 You’ll want to separate the tomatoes that are lightly red all over from the barely colored ones. Lightly red all over: Simply place the lightly red tomatoes into a bowl and set them on the counter or line them up on a window sill and they will be fully ripe in a couple of days. 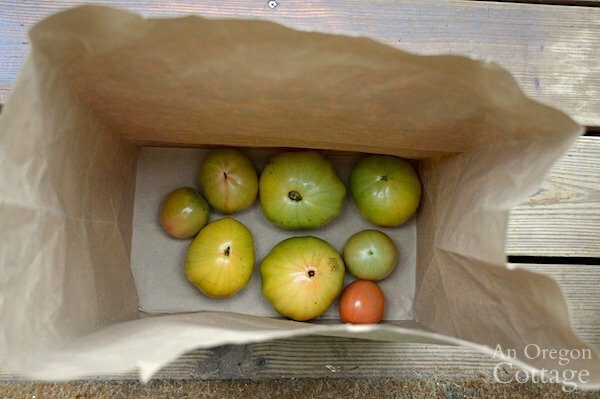 Barely blushing tomatoes: place them in a brown grocery sack in a single layer, or as close as you can get – sometimes you’ll need to put a few on top of others, but just make sure they are balanced between two on the bottom, so they aren’t directly on top of a tomato. Place slicing tomatoes on their tops to keep them in better condition, and paste tomatoes on their sides. TIP: I’ve found that adding one of the lightly red tomatoes, as pictured above, somehow helps the others to ripen better. 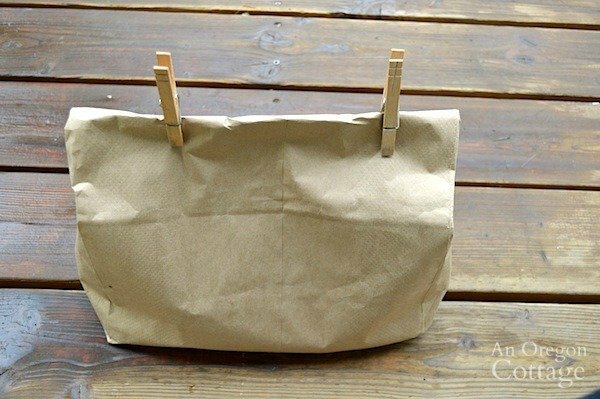 After placing the tomatoes in their bags, fold over the tops a couple times and seal with clothespins or other bag holders. Set them on your counter or in a room you can check often (meaning, where you don’t forget about them, ha!). Step 3: Check your bags regularly. 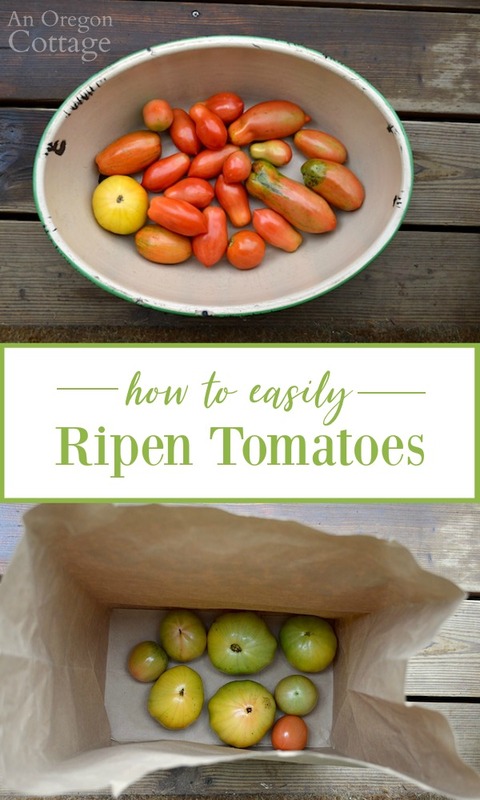 It’s important that these bags of ripening tomatoes be in a place where you can easily check them every couple days, because there will always be one or two that will start to rot and if you can remove it quickly, it won’t spread to the other tomatoes. Pull out the ripe tomatoes, reseal, and check again in a couple of days. 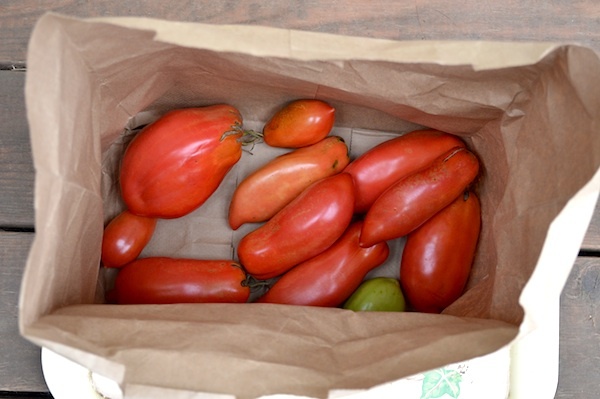 That’s it – three easy steps and a few minutes (depending on the amount of tomatoes you have) and within a week or two you will open the bags to find fully ripened tomatoes! There are often a few areas that need to be cut off, but this method to ripen tomatoes creates fruit that is terrific fresh in soft tacos, salads, and sandwiches, and of course a couple last batches of garden harvest roasted tomato sauce or plain roasted sauce to use in recipes all winter. Wondering about that green tomato at the bottom of the bag pictured above? There’s usually one or two of those – the tomatoes that refuse to ripen. Don’t sweat it – just gather them to make salsa or fry them! How long do these ripened tomatoes last? When I ripen tomatoes this way, I’ve had some tomatoes still going in their bags all the way into mid December. But years when I have to harvest earlier it’s usually through October. But that’s still a pretty good run! How do you ripen tomatoes at the end of the season? This article has been updated – it was originally published October 2013. 1. Slice thin, then can them; when you are ready, dump them out and drain well. Roll gently in a mixture of cornmeal, masa and salt, and fry like fish, until golden brown on each side. 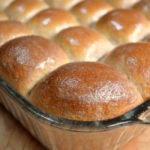 This is a fantastic Thanksgiving side dish. 2. Make Green Tomato Soup. 3. Make Green Tomato Chutney. As any fruit ripens, it releases ethylene. If you select tomatoes which are “mature green”, ie a touch of yellow, placing them together with any ripening fruit will assist ripening. It’s a two way street: ripening fruit releases ethylene, ethylene ripens fruit. A bag full of mown grass will work just as well, but may not be as tasty.In New Zealand, our commercial tomato growers spray the ripening crop with an IWD product called “Ethrel”. This affects only ripening fruit, not ripe fruit, and accelerates the ripening process. Taste tests have shown no difference to fully field ripened fruit. I have even taken hot house tomatoes that is in the grocery and placed them into the brown bag and they ripen to taste like garden grown. Really? That’s a great tip, Shirley – thanks! Great tutorial, beautifully depicted! As my Italian friend says, better green tomatoes than no tomatoes! I love your blog! You do a great job. My kids keep asking me to make your chocolate sauce. I knew you could ripen them if you wrapped each in newspaper & put in box in a dark cool place, but I never did it because it was too much trouble. 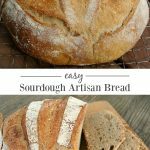 I usually just set mine all on a counter & if it ripens, I use it. But some just rot that way. I might jus try this simpler method. Thanks for sharing! We wrap ours and this year we didn’t end up with too many green tomatoes. In past years we have had boxes full, this year we just ended up with one box, so the wrapping was really manageable. I already have a few tomatoes that are ripe. I like your way of ripening them in a bag. Next year I will have to give the bag a try. 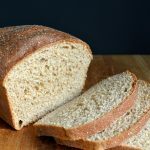 I’ve used the recipe on this website to make green tomato salsa with the green tomatoes that have no potential for ripening. It’s really tasty & I love that I can use up all those green ones. This year I made 10 pints! Great to give as gifts too. ;). Oh, I’ve always wondered if green tomato salsa was good, Katrina – thanks so much for this link and your endorsement! Yes, I ripen tomatoes every year and currently have a couple of boxes full in the linen closet! I planted 9 tomato plants this year and then moved from my beloved Klamath Falls, OR garden to a new place in Carson City NV in mid-September. I had great luck with the weather; I’ve been harvesting ripe juicy tomatoes since the end of July and canned 36 quarts before moving. The last day at the house, I collected about a zillion tomatoes…I layered two layers in small moving boxes separated by newspaper and lugged them all to Carson City. I knew that KFalls was getting a hard freeze the week we moved, so I collected everything possible! Since I’ve been in Carson City I’ve made 4 batches of tomato sauce that grace the freezer. I think I just might have enough to get the two of us through the winter, with pizza, spaghetti sauce, enchilada sauce, salsa, stew and soup, using all the sauce and canned tomatoes! Well, Jami, I am a Master Gardener and YOU are my inspiration 🙂 Love your blog! I couldn’t let those tomatoes go to waste, right? Great post! Your tomatoes look scrumptious! Our second tomato season is just beginning! I do this, too, but I add a banana to each brown bag.